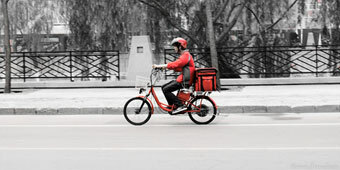 Sometimes Beijing can be surprising, and all of these delivery services are like that. Although a lot of foreign produce seems far away, developments on the delivery and production scene mean that the comforts of home are now more easily attainable than ever. You will no longer have to pine over that cheese, or those sausages, but you can actually get them delivered right to your doorstep or to your work. Andy’s Sausages make a wide variety of sausages, ranging from Lincolnshire sausages to Mexican style chorizo: check online for full availability. They even make sausage rolls, perfect for if you are organizing a party or want to have a barbeque, or if you have not been satisfied with the sausages from the supermarkets. How: Order online, and get them delivered, or pick up from Tavalin Bagels in Sanlitun. How Much: 150 RMB for 1 kg of sausages (many different varieties), or 120 RMB for 6 sausage rolls. From plain bagels to bagels with salmon and flavoured cream cheese – Tavalin, based in Sanlitun next to Yashow Market, has it all and everything is available for delivery. Nothing could be more perfect to help prepare for an elaborate brunch or a party (or just breakfast). How: Order online before 6pm the night before, and they will be delivered to you. How Much: Bagels are 60 RMB for half a dozen, and 100 for a dozen. Cream cheese is 25 RMB for a tub, and you can get other extras too, or a complete lunch. Fresh and organic produce from an organic farm near Beijing. Wide range of produce from a farm that has been delivering its food across Beijing for a long time now. How: Order online or call 400 886 9166 extension 8001 and everything will be delivered for free. How Much: Depends on groceries. A wide-ranged beer shop, Cheers-in has everything covered, including a lot of brands that are not readily available in other shops, and specialty beers. A brilliant way to stock up the fridge once in a while, or to prepare for a party if you don’t want to go out and carry everything back home. How: Order from their online shop, and beer is delivered between 3 and 5 days. How Much: Depends on your taste. Corona Extra is 12 RMB, Hoegaarden Forbidden Fruit is 28 RMB and Brooklyn Summer Ale is 25 RMB. This wine delivery service is incredibly easy to use – with cash and card on delivery accepted. Delivery is only 10 RMB for all orders under 288 RMB, and free above that amount. The wines they offer come in a wide range of prices. Again, perfect to stock up your personal supply, for wine lovers to try something new, or to prepare for a party. Check online for some good bulk buying deals. How: Order from the website. How Much: The cheapest bottle is 99 RMB and the most expensive one 1990 RMB, with a wide range in-between. Beijing, surprisingly, has its own fromagerie, and you can get so many different types of cheese delivered from here. This service doesn’t just deliver to Beijing, but throughout all of China, and the website is in Chinese, English and French. How: Order online and have it delivered anywhere for a small fee depending on your location. How Much: Prices of the cheese vary widely but you can get ‘smokey Beijing’, which looks like a Camembert, for 35 RMB per 120 grams. There is also the option of a black pepper crust for an additional 3 RMB.